There’s no need to say I was super excited and nervous when I heard I would have the chance to interview a member in my favourite band. I was very happy I could interview Andrea as I have always been told that if I would have that chance, I had to grab it with both hands, as he’s a wonderful person to have a talk to. I can now fully agree with this. 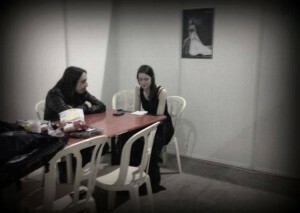 My friends and me were waiting for the signing session of Lacuna Coil, when I got the confirmation to go backstage to do the interview. I knew there was not much time, so I wrote down only a few questions I really wanted to ask him. It would be my first ever interview, so I warned Andrea in advance that I could possibly sound weird at times! Hello Andrea, how are you doing today? I’m good! I’m a bit tired because we arrived yesterday night and then we had a few beers at the hotel. But I’ll be fine by the Showtime! You also played at this festival last year, and this year we can immediately notice a change, because Cristiano, the drummer is back on the road and that’s amazing news. Marco is still at home, how is he doing? Marco will be back next week, actually. 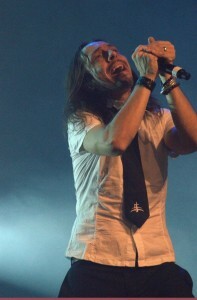 We will leave on Saturday for some photos and stuff, then we will start the tour with Paradise Lost and he will join us. So he’s doing fine with his arm again? Well.. It’s way better, still not 100% right. So he’s going to try on that tour, luckily it’s just a three weeks tour, so he can see how it works out. During the last tours, he had to stay in Italy while you guys where on the road, so he had the time to start working on the album. I suppose that’s also the reason why you could all start so soon with the recording? Yes indeed, it helped a lot; he was home for a few months so he had the time to work on new material. We still had to kind of finish the album in the studio because a lot of lyrics had to be written and other stuff had to be done. Eventually we have great songs because Marco really had the chance to work on it and really change the songs a lot. Last Sunday, you have finished the recordings for the album, so now the mixing process can start? Yes, that will take a couple of weeks. So how did the collaboration with the new producer, Jay Baumgardner, go so far? It was good, it was a different experience again. I can’t tell much about the album yet as we don’t know how it will sound yet. The mixing process has to be finished first. So far it has been a good experience, he’s definitely a professional and we have a good relationship with him. Is there anything about the album you can already reveal to us? For example what are the thoughts that have driven you when you wrote this album? In general we’ve been writing about life stories as always, but there is kind of a feeling behind the album, which we are going to reveal when we reveal the title. We are still deciding on the final title. So I can’t say much about the new music, but it’s definitely going to be very inspired. To us, it sounds already like a good album with good songs! For tonight, you decided to play the entire Karmacode album, why did you choose that album? 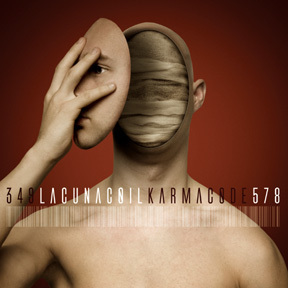 You chose Karmacode, maybe because it’s a bit in the middle of all albums? Or is there any other reason? Yes, it’s also the most successful album we ever had. Off course it’s hard to say what our most successful album is, because even if you do good on the record sales, the times change and it becomes more difficult for bands to sell their records. The record sales are not the same anymore, so it’s hard to tell, but in general it has been the best-selling album. It could be that or Comalies, otherwise it was going to be the new one. Maybe one day we will also do the Comalies one. That would be nice! When there would be a poll between the fans, I think the 2 albums that would be chosen most, would be Comalies and Karmacode. Yes, the old ones are the most popular, for sure. After today, you will go back to Italy, and then in about ten days, you will be in the UK for the new tour? Yes, actually in exactly a week, we will be in the UK. You will tour there with Paradise Lost and Katatonia, I suppose you’re looking forward to it? Yes off course, it’s going to be a great tour. We know the guys from Paradise Lost already, we’ve been playing at festivals together, so we know each other for many years. We never met the guys from Katatonia. I know the band, but I never met them personally, it will be nice. It’s a good package, all three bands have their history and they have great albums, so I think it will bring good vibes to the tour. It’s not a long tour, which is very good for me, because I don’t like to tour for too long, even if we always do long tours (laughs). On a shorter tour, you’re more focused and probably don’t get sick. When you started as a band, Paradise Lost was an important band to influence you, to help you with finding your own sounds. Apart from Paradise Lost, what are the other bands that have really inspired you throughout the years? When we started, we were listening to all kind of rock and metal off course, but the main bands we were listening to were Type O Negative, Paradise Lost, Tiamat, a Greek band called Sceptic Flesh. Those bands really inspired us a lot when we started, but then we discovered many more bands. We were listening to either the classic metal bands like Metallica, Slayer, Iron Maiden or this more gothic, dark kind of metal that was new at that time. These last category of bands really inspired us to find our own sounds, in that direction; a little slower and darker. When you would have the opportunity to work on a song/album with any other band/artist, who would you choose? There are many bands that I like, but that doesn’t mean it would be a good result. It all depends from the song. Once you sit down with people and you hear the song, you can discuss it and see if it works or not. So I can say I’d love to do something together with Depeche Mode for example, but you need to sit together for that, you never know in advance if it will work out fine. I think it’s something you discover when you meet other people and get to know each other a bit more. It has to be something that is based on a good relationship and then made into a good song. Yes off course, most songs are made by sitting together and sharing thoughts, it’s important to agree with each other. Yes even when we have music from Marco, or any of the other guys, it’s not necessarily inspiring us. Sometimes you just don’t find the right chemistry, you don’t find the right vocal lines. Sometimes we have to put songs aside because they don’t really convince us. It’s good that you can come together as a band and honestly tell your opinion, everyone who decently knows the band can say that you are connected like a family. It’s good, it has been like this since day one, since we started. It’s important that we have this relationship and it’s the best for the music, for the band. Because if you just use a song because someone in the band wrote it or if I come in and say “this is the chorus and it has to be this”, it wouldn’t work out well. We share, we listen, we discuss things. For example we can say “this works better with my voice, this works better with Cristina’s voice”. It all depends from the music off course. Now something completely different, you’re playing here at the MFVF, what are your thoughts about the line-up? I was reading and I don’t know many of the bands, most of them are new, for me at least. I didn’t have the time to check them all out. For sure I know Leaves’ Eyes, because we toured with them in the past, so we’re friends with the guys. I know Tarja , Delain, … but really a lot of the bands are new to me, which is very cool. I would love to check them out, but I’m just going to rest here a bit in the backstage and get ready for tonight. We have a very late show and have to save some energy. But it would be cool to come as a spectator instead of having to play. If you have to play, you have to do interviews, you have to eat, doing photos and stuff. It’s not as good as when you’re just having fun and can discover new bands. I think for somebody that really likes the female metal genre, it’s a pretty good festival, because it offers a big variety of bands. It’s also not a huge festival; it’s perfect if you’re really passionate for this kind of metal. It’s more about the music and the attraction for this style. Yes, people from America and all over Europe are coming to this fest. I also know a lot of people from other countries that would really like to attend the fest one day. It’s definitely special and different. Also, most other festivals are in the summer. This festival is all about the female voices, like you said. Do you sense that in the atmosphere, do you notice any differences in the crowd? Well, there are more girls, for some reason. Especially backstage! (laughs). No seriously, I’m sure people know the bands they’re coming for. The ‘female’ theme is a good excuse to put together a different package for a festival. But it doesn’t have to be all focused on female singers. Yes, I agree and it’s not always good to put a band in one certain category. Some bands fit in one genre and are happy with what they have, but it’s just nice to play with a variety of sounds and that’s what we do. 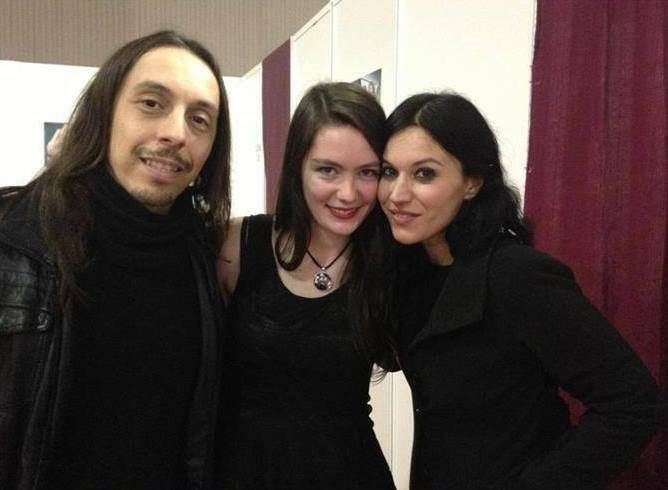 As a last question, I would like to ask you what you expect from your future with Lacuna Coil, are there any things you really want to achieve in the future? We have reached far beyond what we were expecting, back in 1996/1997. It’s all been way beyond every possible expectation. Off course we always hope to do bigger things, to play for more people who love our style. We are definitely happy with what we have now. If we can bring it to the next level, it’s great off course. We always have different people coming to see the band; many groups of ages are following us. It’s very cool to know that we still have a sort of attraction for the new generation of fans. It’s cool to see all these different kinds of crowd together at a show that is a big achievement for us. Many bands have to struggle to find a new fan base when they grow older, because sometimes people get older and get less interested. We have that refreshing sound that keeps different groups of people interested. It’s very cool that you can also tour together with different bands. For example on the Gigantour last year, you played with Motörhead, Megadeth and Volbeat and you can always fit in right! Indeed, we can play all the European festivals; the very gothic ones, this one, the more rock/metal ones, as well as touring with Sevendust, Slipknot, System of a Down… We just played a show a few weeks ago in Milano with System of a Down and Deftones. So, our music is variable and that’s what I like. Sometimes it’s hard because it would be easier to be just the new Within Temptation, the new Nightwish, you know. But it’s not what we are. We have our own approach to music and that’s why we can keep going for many years and can still be very passionate about the music we do. I want to thank you very much for doing this interview!